Once again, the Logistics & Distribution category received many entries this year – as might be expected. There were high scores across the board, so the judges had a difficult time determining the winner. However, the two top entries came down to Euro Car Parts and Pladis. From left to right: Gerald Okullo, sales manager, Akabo Media, David Watson, Head of Warehouse Operations, Pladis, Bill Hooton, National Transport Controller, Pladis, Grace McIntyre, Head of Commercial Logistics, Pladis, Rob Wright, Head of Distribution, Pladis, Lee Nicholis, Vice President UK/Europe Supply Chain, Pladis, Paul Collis, UK Supply Chain Director, and host Sara Pascoe. Euro Car Parts distributes parts for all makes of cars and light commercial vehicles and has more than 130,000 different stocked part numbers. Originally established to supply BMW, Mercedes, Porsche and VW car parts, the company has now expanded into all-makes, a move that has prompted an investment into a highly automated distribution centre. The new 850,000 sq ft facility, with a 250,000 sq ft mezzanine, incorporates state-of-the-art technology – a 34,000 pallet VNA, a 15 crane mini-load ASRS, a 90,000 location flashpick goods-to-person module and a pick-tower. The scale and sophistication of the project took the interest of the judges and the benefits of the investment to the business, in terms of greater accuracy of pick, faster throughputs and higher capacity, were fully appreciated. This was a project worthy of praise by the judges, but they fell just short of taking the trophy. The entry from Pladis, a global biscuit and confectionery business, outlined how over the last three years, the logistics team have delivered big changes in performance in service, operational efficiency, safety and environmental sustainability through innovation and advanced projects. As part of its programme the business radically changed the way in which it engaged with customers. It mapped customer touch-points across each function, which enabled the business to find plenty of opportunities to help it understand what is important to customers – starting by researching their benchmarking and publishing data within its own business. For the judges this was a well-executed exercise, demonstrating the benefits that come from close collaboration with suppliers. The delivery performance record for all orders delivered at the first attempt and on-time were hugely impressive and, in fact, topped the Tesco supplier league table for delivery performance in 2015 and 2016. This was a company that had suffered major flood damage at its Carlisle factory in 2015, which closed the plant for three months, and yet it came back fighting, winning the praise of customers. 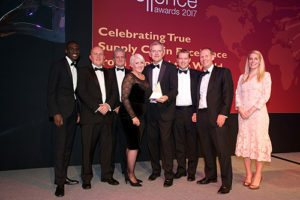 There could be little doubt that Pladis deserved to win the Logistics & Distribution Award, and so the trophy went to Pladis.